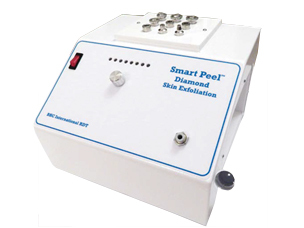 BHC International USA & SoundSkin are your source for Smart Peel Microdermabrasion systems. Smart Peel microdermabrasion offers perfect exfoliation with no crystals or exfoliated skin left on the client. Smart Peel Crystal and the new Diamond technology have been proven in worldwide climates to consistently deliver a safe and practical dermatological solution for problematic skin. Researched and developed exclusively in the UK by founder Bryan Hall, BHC International is a leading designer and FDA registered Medical Device manufacturer of Microdermabrasion equipment.